In Arizona Territory sometime after the Civil War, Georgian Jennifer Ballard (Donna Reed) rides a stagecoach to meet her fiancé, Ben Warren (Rock Hudson), the couple bound for his ranch in California. A fellow passenger, calling himself Hamilton but actually outlaw Frank Slayton (Philip Carey), is quite taken with Jennifer. Her Southern graces remind this lonely, bitter former Confederate soldier of happier days. He pressures her to have dinner with him, upsetting Slayton's right-hand man, Jess Burgess (Leo Gordon). When Ben unexpectedly meets Jennifer at a stage stop, Burgess subtly hints they might want to transfer to a different stage. Gun Fury is way above average for a ‘50s Western, a hair's breadth below the great Anthony Mann films with James Stewart. Like those pictures, Gun Fury has psychologically complex heroes and villains, while the screenplay by Irving Wallace and Roy Huggins (based on a novel by Kathleen B. Granger, George Granger, and Robert A. Granger) also vaguely exhibits whiffs of High Noon, released the year before. This was Columbia's third 3-D Western, released just as the new widescreen CinemaScope process was signaling the end of the ‘50s 3-D boom. 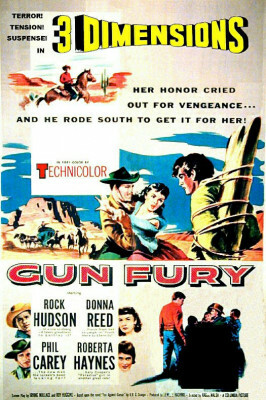 Where most ‘50s 3-D titles are known for throwing and projecting items toward the camera (and thus the movie audience), Gun Fury opens with POV shots from the buckboard of the stagecoach as it races down a canyon pass. The effect is more like the audience participation tricks of Cinerama (such as its famous rollercoaster ride in 1952's This Is Cinerama) yet it's very effectively done here. Walsh's use of Arizona locations, similar to John Ford's beloved Monument Valley, is also effective.